After six months of traveling around the world, our life has now finally settled back to normal. And that is when we realize that we don’t know what normal is anymore. Even though Luise and I have been living together for a couple of years, it feels like our life as a family starts now. Just like Elsa, we are taking our first trembling steps towards our new family life. Right now we have no idea how that life will turn out, how we will find a balance between work and family, or even in which country our life will take place during the next couple of years. You might say that we have some figuring out to do. 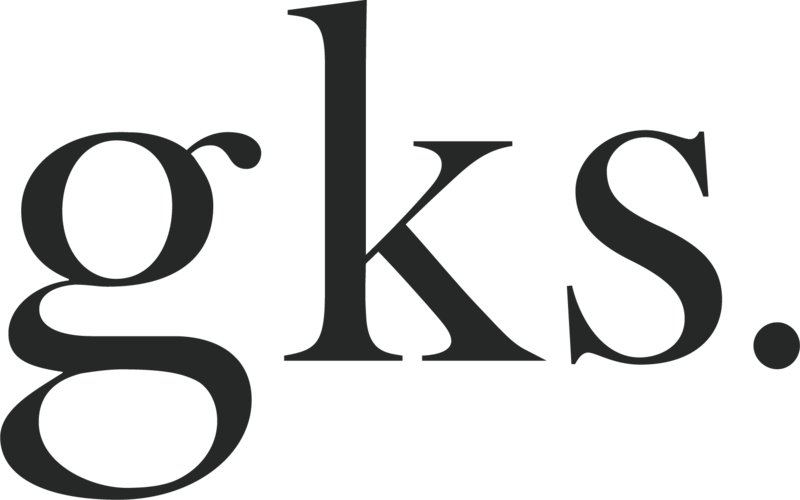 One thing that we do know, is that we will keep on sharing our favorite recipes with you. 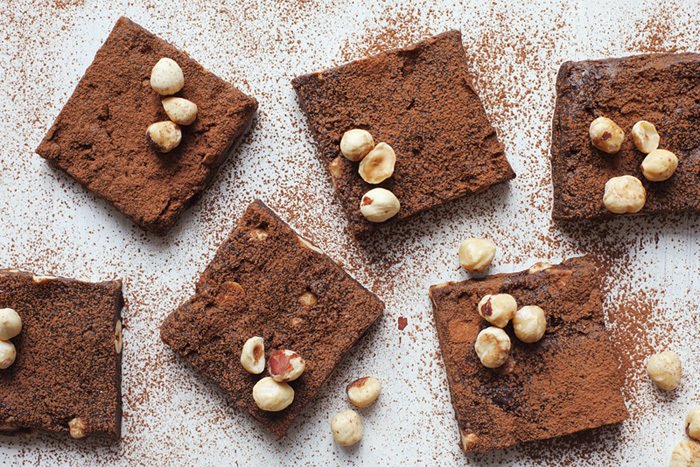 Like these Chai & Hazelnut Brownies that Luise made the other day. 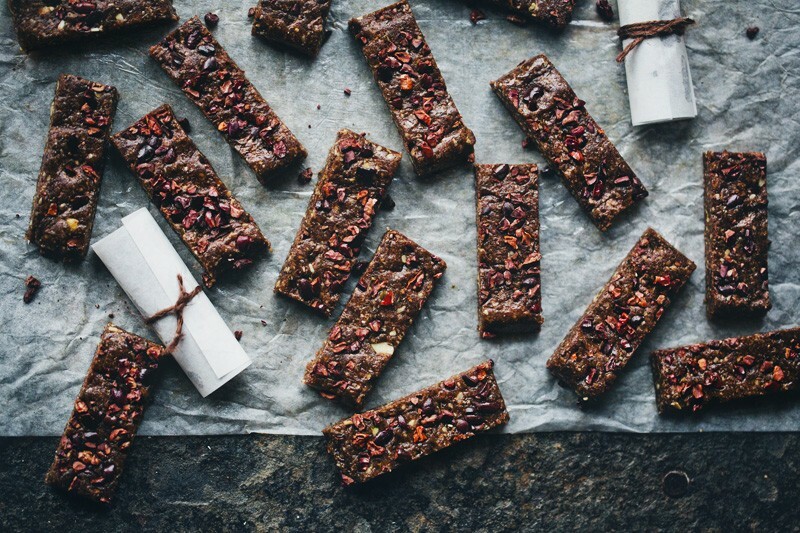 We would be lying if we called them healthy, but they are at least vegan, raw and gluten free. And they taste – pardon my french – fingerlickin’ good! Before moving on to the recipe, we want to give you some basic tips when baking with dates. 1. Always use fresh dates. They should be dry on the outside, and very soft and sticky on the inside. 2. If you have to use dried dates, you need to soak them in drinking water a couple of hours before baking with them. 3. If you can’t find dates at all you can try using raisins, dried figs, dried plums or dried apricots (remember to always soak dried fruit first). 4. When you blend dates they should turn into a very sticky paste, so you need a strong food processor or blender. If you do not have one, place the pitted dates on a plate and mash with a fork until sticky and like caramel. What makes this cake special is that it is spiced up with chai spices, it gives it such an unique taste! Use normal tea bags, cut them open and just pour them in the dough, isn’t it easy? -and you can choose green, black or herbal chai tea! 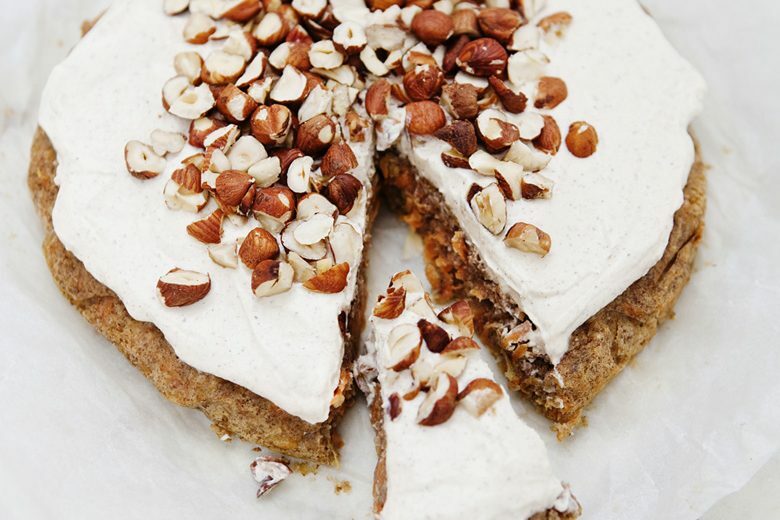 Place all ingredients, except the hazelnuts, in a food processor or a high speed blender. Mix until smooth, you probably have to scrape the mixture down with a spoon a couple of times. Add the chopped hazelnuts and knead the ‘dough’ by hand. Cover a brownie tin with plastic wrap and press down the dough to about 1/2 inch (1,25 cm) high. Rub a bit of coconut oil on your hands to prevent the dough from sticking. Put the cake in the fridge and let it set for a least half an hour. 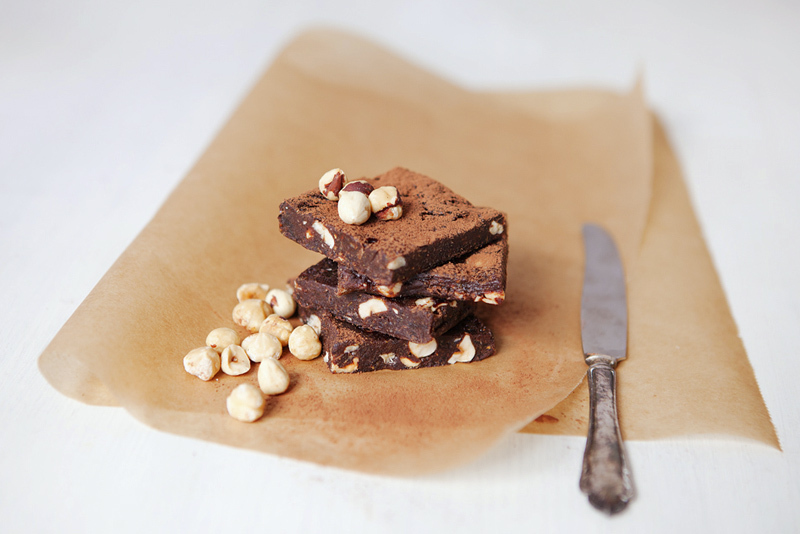 Cut in brownie-size pieces, dust with cacao powder and sprinkle with hazelnuts. Oooh, I can't wait to give these a try and with the chai....yuuum! Although dates are VERY high in natural sugar at least the sugar comes hand in hand with loads of calcium, sulphur, iron, potassium, phosphorous, manganese, copper and magnesium. Dates help in fighting constipation, intestinal disorders, weight gain, heart problems, sexual weakness, diarrhoea and abdominal cancer. Not bad for a yummy sweet treat! Thanx for sharing. Wow..... As usual, I'm salivating and inspired. Making these some night this week! I'm constantly blown away by your recipes. It's either raw or vegan or gluten free... it's such an inspiration. Will have to give this a try. Welcome back to Scandinavia, we've missed you! These are perfect for my sneaking in fairily healthy sweets without anyone knowing-campaigne. Gorgeous! Skal prøves inden for de næste 12 timer! 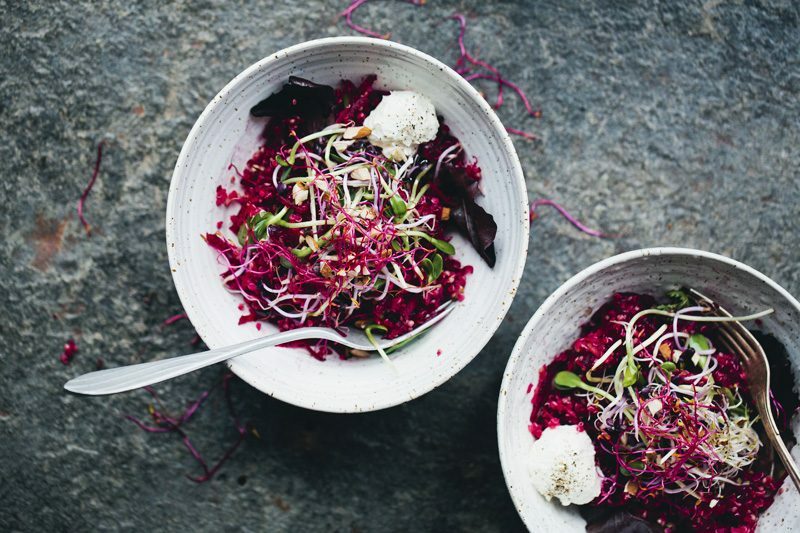 I have always been a little bit weary of raw diets, but not I am getting into it more and more, because I keep on seeing wonderful recipes like this! Love the idea of the tea & the spices...simply delicious sounding...& looking, beautiful pictures. Yum, great idea about adding chai to these! Love the video of Elsa's first steps, what a beauty, and what a beautiful place to take first steps. I'm sure you guys will do great as you figure things out, you're a lovely family. 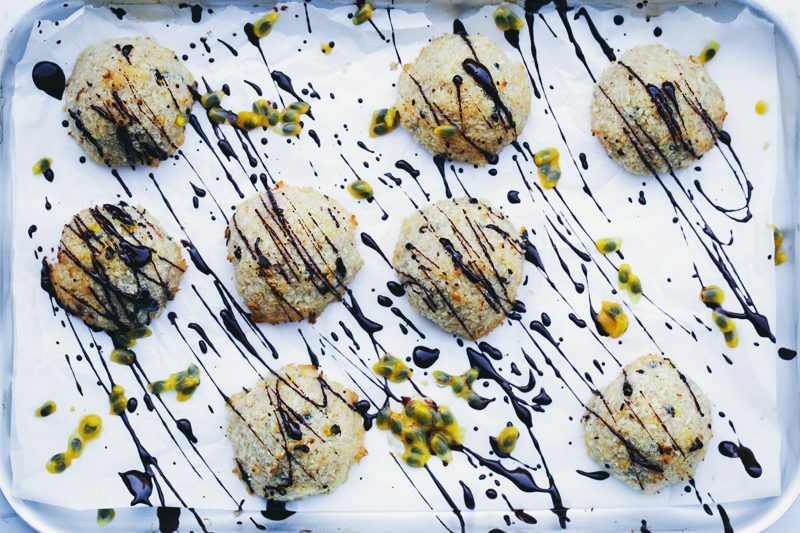 These look amazing - and the cookbook sounds good too. Wonder if I can somehow get hold of a copy here in the UK? Worth a try anyway. No baking is a bonus! 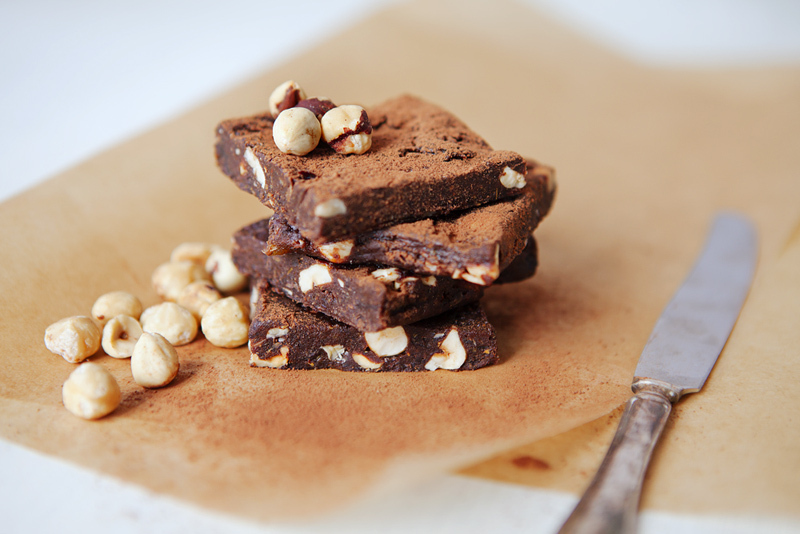 Mmm - little squares of chocolatey, gooey awesomeness! I want!